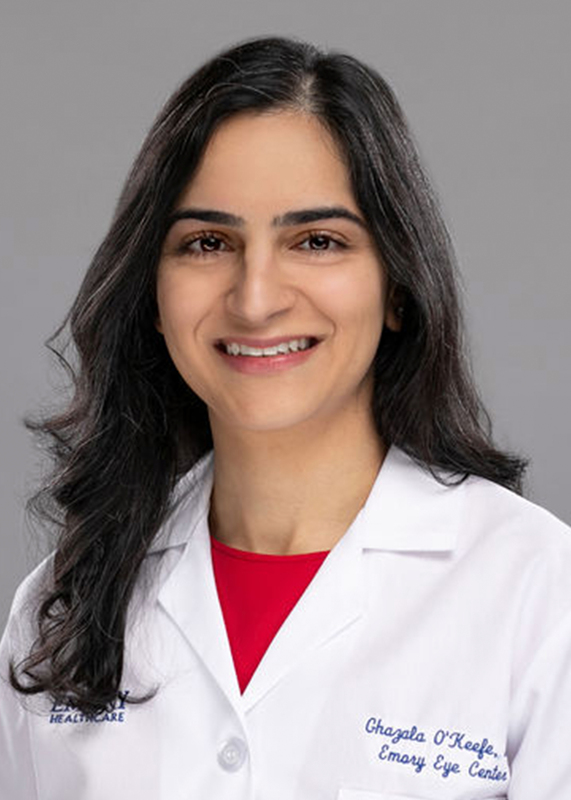 Ghazala A. Datoo O’Keefe, MD, joined the Emory Eye Center on November 1, 2015. Dr. O’Keefe brings expertise in medical retina and uveitis to the Eye Center, helping care for an expanding uveitis patient population. Dr. O’Keefe received her MD from the Johns Hopkins University School of Medicine in 2010. She completed a residency in Ophthalmology at the University of Southern California (USC) and the Doheny Eye Institute, followed by a medical retina and uveitis fellowship at the University of California, Los Angeles (UCLA) and the Doheny Eye Institute. Her primary practice location is the Emory Eye Center main location on the Emory University/Emory Healthcare campus. Her clinical work focuses on inflammatory and infectious diseases of the eyes as well as retinal degenerations, age-related macular degeneration (AMD), and diabetic retinopathy. Dr. O’Keefe teaches medical students as well as ophthalmology residents and fellows at the Eye Center as well as at Grady Medical Center and leads the monthly medical morbidity and mortality conference at Grady. In 2016, she helped lead a successful effort to increase access to more effective, higher-cost injection medications for patients at Grady. Her research interests include infectious and auto-immune diseases of the eye, AMD, diabetic retinopathy, and retinal imaging modalities. She is also interested in quality improvement, including inter-departmental collaborations with other Emory programs, and is currently working on a project with the department of Rheumatology to improve patient care. Dr. O’Keefe is board certified by the American Board of Ophthalmology. Her peer-reviewed articles have been published in a number of leading journals, including Survey of Ophthalmology, Ophthalmic Surgery, Lasers and Imaging Retina, Neurosurgery, and Annals of Surgical Oncology.